We are delighted to have hosted Professor V. Spike Peterson, Professor of International Relations in the School of Government and Public Policy at the University of Arizona as a Visiting Professor at SPERI. 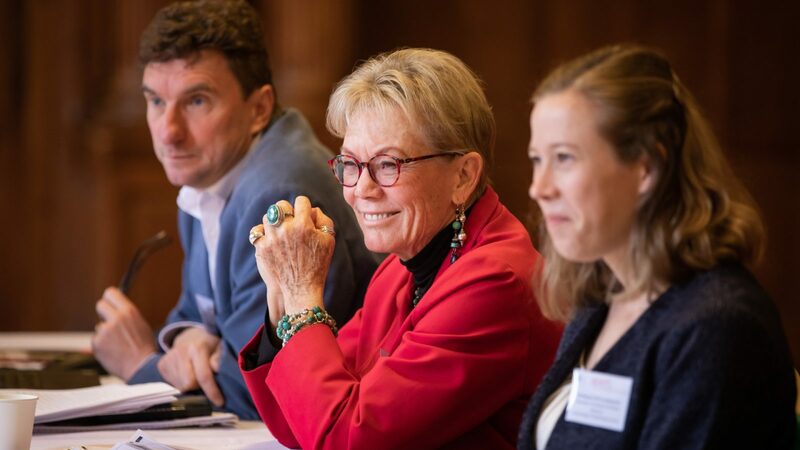 Whilst at SPERI Professor Peterson has participated in the two-day ‘Political Economy on Trial’ workshop and was a panellist at our public roundtable event. Professor Peterson gave a talk in the Department of Politics entitled ‘Intimate Relations, International Crises: Marriage as Racist and Geopolitically Problematic’. Students at Sheffield have also had the opportunity to benefit from Professor Peterson’s significant expertise. She led a special two-hour workshop for students who are working on gender in international relations, politics and political economy, focused around feminist research. 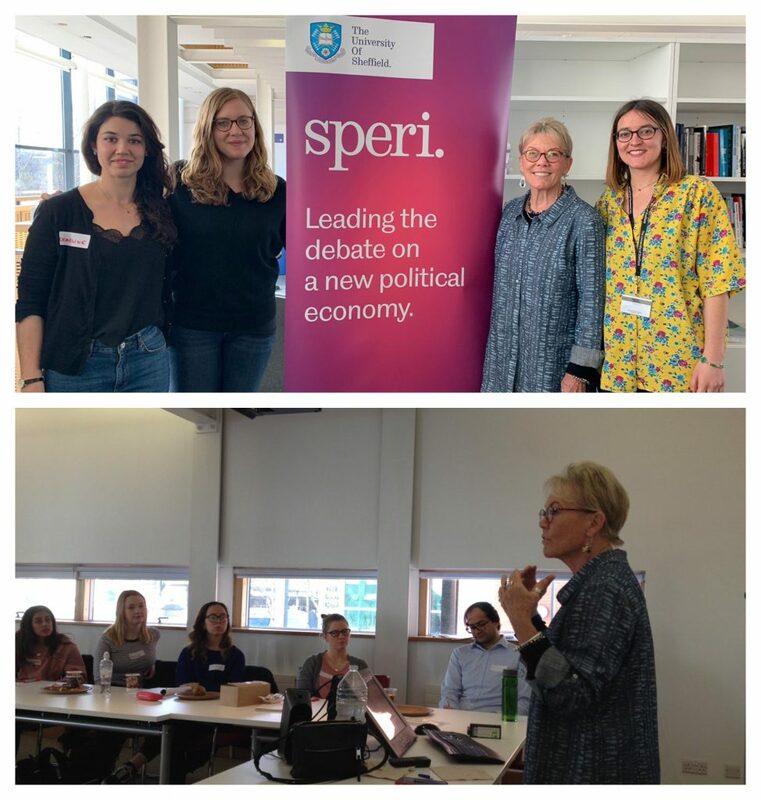 At the workshop Professor Peterson spoke to the students about how feminist and gender approaches can be used in relation to various international relations, international political economy and politics topics, and what it means to ‘do feminist research’ and how to do it. V. Spike Peterson is a Professor of International Relations in the School of Government and Public Policy at the University of Arizona, with courtesy appointments in the Department of Gender and Women’s Studies, Institute for LGBT Studies, Center for Latin American Studies, and International Studies. She was recently awarded a Richard Hodder-Williams Fellowship by the School of Sociology, Politics and International Studies at the University of Bristol, United Kingdom, where she resided for several months in Spring 2018. She was also honoured to receive the 2018 LGBTQA Scholar Award by the LGBTQA Caucus of the International Studies Association, which recognizes her long-standing and pioneering research in queer approaches to IR and IPE. In 2016 she received the Charles A. McCoy Lifetime Achievement Award by the American Political Science Association. Peterson was earlier awarded a Leverhulme Visiting Professorship and was hosted by the Critical Global Politics unit at the University of Manchester, UK during the Fall 2016 term. During the spring of 2014 she was a Senior Research Fellow hosted by the Department of Geography at Durham University, England, and during 2008-2011 was an Associate Research Fellow of the London School of Economics. Her book publications include Global Gender Issues in the New Millennium (2010) and two earlier editions of Global Gender Issues (1999, 1993) with Anne Sisson Runyan; her own A Critical Rewriting of Global Political Economy: Integrating Reproductive, Productive and Virtual Economies (2003); and Gendered States: Feminist (Re)Visions of International Relations Theory (1992), which she contributed to and edited. She has published more than 100 journal articles and book chapters, most recently on informalizations of work in relation to structural inequalities and their corollary insecurities worldwide; global householding; gendering war and its economies; and critical queering of marriage, citizenship, migration and states/nations. Professor Peterson currently serves on the editorial boards of International Feminist Journal of Politics; Globalizations; Journal of Women, Politics and Policy; New Political Science; Politics & Gender; and Perspectives: The Review of International Affairs.